↑ Government of Ireland (1937). "Article 4". Constitution of Ireland. Dublin: Stationary Office. 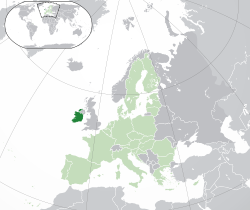 The name of the State is Éire, or, in the English language, Ireland. ↑ Government of Ireland (1948). "Article 2". Republic of Ireland Act, 1948. Dublin: Government of Ireland. It is hereby declared that the description of the State shall be the Republic of Ireland. Gilland, Karin (2001). Ireland: Neutrality and the International Use of Force. Routledge. ISBN 0415218047. Greenwood, Margaret (2003). Rough guide to Ireland. Rough Guides. ISBN 1843530597. Mangan, James Clarence (2007). James Clarence Mangan - His Selected Poems. Read Books. ISBN 1408627000. Meinardus, Otto Friedrich August (2002). Two thousand years of Coptic Christianity. American Univ in Cairo Press. ISBN 9774247574. Moody, Theodore William (2005). A New History of Ireland: Prehistoric and early Ireland. Oxford University Press. ISBN 0198217374. หน้านี้แก้ไขล่าสุดเมื่อวันที่ 12 มิถุนายน 2561 เวลา 08:54 น.